Though cotton requires a large dose of pesticides to grow and silk is harvested from silkworms (both of which don't make it very eco-friendly), the sari can still be a more sustainable choice of garment over factory-made apparel. And yes, there are organic cotton saris and Ahimsa silk too, to choose from, if you’d like to invest in a wardrobe that’s completely free of pesticides and cruelty. 1. Handloom saris promote an age-old craft and tradition. 2. 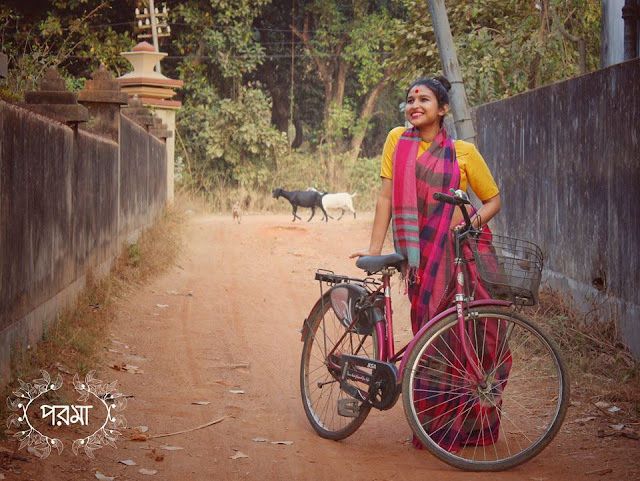 When you buy handloom saris, you're helping keep this art alive + helping weavers to do what they are so good at doing. 3. You can create a fabulous wardrobe with just a few saris. Mix-and-match your t-shirts and blouses + accessories to create new looks. 4. There aren’t tonnes of wastage while weaving a sari. 5. If looked after just a tad, a sari can last you a life-time (so that means you don't have to buy and buy and buy). 6. Got some old saris? Turn them into cushion covers, curtains, blankets and hey, even cloth pads (if they are very old and soft). 7. A sari is perfect for India's climate - good ventilation during summers and great insulation in the winters ;-). 8. If you've got saris in your closet, you don't have to buy a lot of different clothes (example: party gowns, evening dresses, several jeans etc). So you can create a handmade (and capsule) wardrobe with a bunch of saris, tops and blouses and a few other clothing of your choice. 9. Have some gently-used saris? Donate them to organizations like www.goonj.org - and your saris help clothe another woman in another corner of the country. 10. You somehow feel more in touch with nature, when you wear a sari (if you're a sari gal, you'll know what I mean). Why do you think sari is an essential part of sustainable style? I'd love to hear your reasons here at our online community of women - Lush Green Wellness. 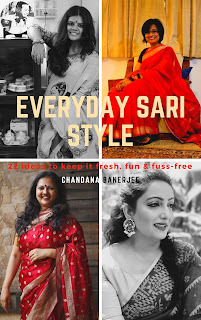 And don’t forget to get your free copy of the ebook ‘Everyday Sari Style’ by subscribing to this blog. A sari certainly brings out the grace and charm of the wearer. Hail the Sari, hail India!